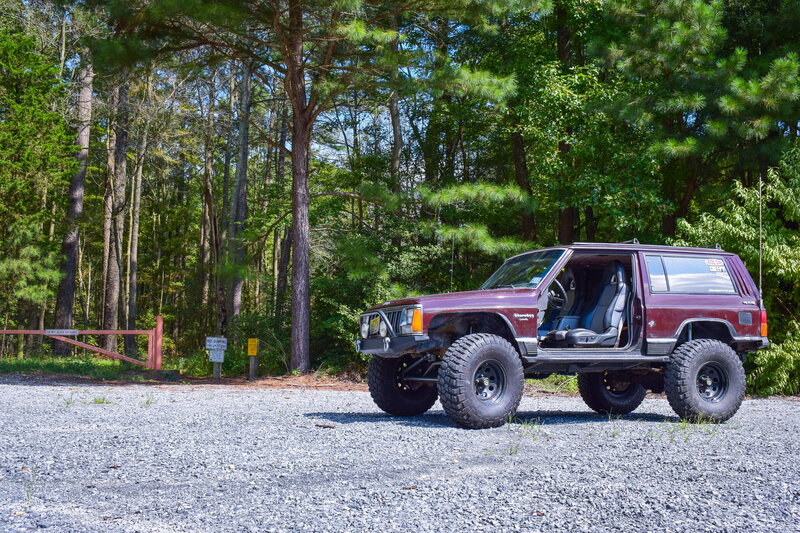 I'm not sure what setup to go with, I plan on using my 00 XJ (AW4, 4.0, stock with 212k miles) as a DD with occasional off roading mostly beach and light trail stuff. Any help you guys can provide would be greatly appreciated, and I do plan on trimming and probably going with the bushwacker flat flares as well as these mods. I am thinking of going with either one of these lifts, but am open to any options that you may suggest. With either of these tire sizes I was thinking of going with a set of g2 4.10 gears, I plan on doing at least a rear locker, if not both front and rear, but I am still doing my research on what I want and how much I am willing to spend on the locker/s. I want the best driveability overall, so I was thinking something selectable such as an OX, but I keep reading good things about spartan lockers. With either the Rocky Road Outfitters high steer kit or the cav fab system. Basically my steering components are all old and could use a refresh anyway seeing as these kits basically replace everything and upgrade them at the same time. I have already ordered some brown dog motor mounts to replace my failing ones, and some odds and ends here and there. Last edited by jbusmc1986; 12-20-2018 at 10:29 PM. I'm semi new to the XJ but a couple things I've read so far. If your looking into a lift over 4 inches might wanna budget for a SYE also. I'm currently on a 3.5 lift and did a drop case that seems to have worked well so far. Also i'm not positive but I know I have read that OME doesn't make a lift that big. Quadratec has great deals on tires and wheels. I been eyeballing that CAVFAB kit myself looks pretty quality. I've seen too many leaf springs snap, bushings crumple in less than a year, parts not lining up, and other issues to ever give RC any money. Just my thoughts, never had an issue with Rusty's and am using their crossmember/tcase skid too. I got the Cavfab crossover steering and holly cow, it is veru beefy compared to the stock one, it is solid steel so I don't thing I'll ever have any problems with it. Additional to the crossover steering I also put the durango steering gear and got a WJ steering pump. How much of a difference did you notice with the WJ steering pump? I wouldn't get RC go with Zone or Rubicon Express. For the lockers, lunchbox lockers like a Spartan or Aussie are cheap, easy to install and work great. If you are getting 33" tires then go with 4.56 gears. And don't buy anything from Banks, way overpriced, there are products that are better or just as good for cheaper. What do you suggest? I found the banks header for 25% off and other comparable headers I have found are a lot more or aren't stainless steel. You can get Banks/Gibson knockoffs on eBay for about $150. You get what you pay for though. Some don't fit without being hammered and others crack after a few thousand miles. I have on​e now that I planned on putting on my daily, but it's factory manifold is (knock of wood) fine so I had second thoughts. I also have a Gibson stainless steel header on my rig and it's awesome. Fit perfectly and still leak free and relatively quiet. I would not have bought it other than finding it on Craigslist for an absolute steal for $200. About your lift, seems like you have a solid plan. I'd say go for the 33s since you have aftermarket fender flares. I got an APN header from Summit for a little under $200. Thats my thought exactly, I would rather pay $400 once for a header from a reputable company than 200 a few times over the next 10-15 years.